So here we are, in blogspot now and quite happily so. Today was a “funny” day in class. I heard that one of our teachers had suggested that to understand the concept of mula bhanda , you could try visualizing a potato up your “@@@”, yes, he said that. I found it funny but a bit painful to visualize. 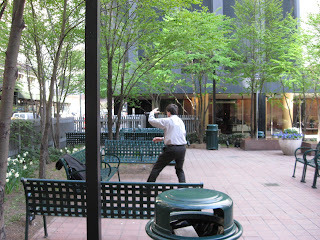 On the way to work I found this white westener man doing tai chi outside his job, I think there is hope after all!, something is definitelly shifting.